Ferrari P80/C - What were they thinking? 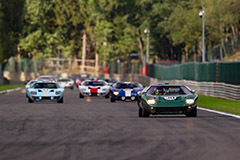 Ford GT40 Mk II - A common misunderstanding this. One of the star cars at the recent Espiritu de Montjuic was this Aston Martin DBR9. The very last of the ten works cars built, it was only used in period for the 2007 24 Hours of Le Mans where it was driven to a class victory. Now in private hands, the successful DBR9 qualified on pole position for the Endurance Racing Legends races in wet conditions. Aston Martin will embark on a new adventure by entering in DTM with the AF Racing developed Vantage. To mark that occasion and the 100th anniversary of Zagato, the three companies have collaborated to create the Vantage V12 Zagato Heritage Twins. In reference to the original Aston Martin DB4 GT Zagato, just 19 examples will be built of the Vantage V12 Zagato Coupe and Vantage V12 Zagato Speedster each. They are expected to be delivered to customers later this year. While Zagato bodied Aston Martins are the stuff of legend, there are only a handful of Ferraris clothed by the Milanese company. One of these rare exceptions is this 348 TB Zagato Elaborazione, which was built in very small numbers in the early 1990s. It was effectively a redesign of the Pininfarina designed 348 and featured circular lights at the front and back as well as Zagato's trademark double bubble roof. The very first of these very rare Zagato 348 TBs, will cross the block next month in the RM Sotheby's Villa Erba sale. Last week, the vast Messe Essen exhibition centre hosted the 31st annual Techno Classica. The traditional reminder that a Porsche 911 or Mercedes-Benz 300 are not rare cars, the 2019 edition attracted an impressive 190,000 visitors from 46 different countries. They were treated to 1,250 exhibitors, who had a startling different 2,700 collector cars on display. Among the highlights of this year's Techno Classica was a display of all Mercedes-Benz C111 versions, a rare Audi R10 for sale and the spectacular 1933 Mille Miglia class winning Alfa Romeo 6C 1750. New for the 2019 show as a RM Sotheby's sale with well over 200 cars crossing the block in the company's first ever sale on German soil. Grabbing the most attention was a pair of Lancia Group B road cars that sold for twice their estimate. As always, we were on the show floor for a good hike to capture all the highlights. The result is this concise report that is illustrated by this 190-shot gallery. At this week's New York Auto Show, Porsche finally revealed the production version of the highly anticipated 911 Speedster. Limited to just 1948 examples, in reference to Porsche's year of establishment, this car represents the final incarnation of the 991 generation 911. 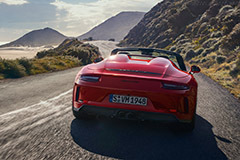 Engineered by the Porsche Motorsport department, the spectacular Speedster uses the same 500bhp engine as the GT3 and comes with a six-speed manual gearbox as standard. Among the other releases in the 'Big Apple' were a pair of Korean show cars. The first of the pair is this Genesis Mint, which is Hyundai's luxury arm's vision of an all-electric, luxury city car. Kia, meanwhile, showcased the Habaniro Concept. Just like the Genesis concept, the Habaniro provides a look at an all electric future. In Shanghai, Karma Automotive offered a first look at the company's 'new dawn'. Among the cars showcased at the Chinese show were the Pininfarina GT; a coupe designed by the Italian carrozzeria, and the altogether more radical SC1 Vision Concept. This morning, at the Auto Shanghai motor show, Lotus revealed a glimpse of the company's first all-new car in over a decade. Dubbed the Type 130, it will be an all electric hypercar. Full details and the final design are due to be revealed later in the year in London. A Lotus that was very much on display in Shanghai was the Evora GT4 Concept. As the name suggests, this is an Evora built to GT4 specifications and signals Lotus' intention to return to international racing. The Evora GT4 features the familiar supercharged Toyota V6 engine that produces 450bhp in GT4 specification. Another car that debuted at the important Chinese show is the Audi AI:ME. This compact machine is slated by Audi as a 'visionary mobility concept'. It is powered by a single 125kW electric motor that drives the rear wheels. At the New York Auto Show later this week, this all-electric Qiantu K50 will break cover. 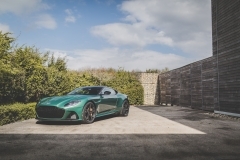 Developed by Mullen Automotive, the compact sports car is equipped with electric motors on both axles that produce a combined peak output of 429bhp. Ahead of the planned introduction at the start of the 2020 rally season, Peugeot have started testing the 208 R2. This entry-level rally car is based on the 208 production car introduced in Geneva last month. It is equipped with a PureTech three-cylinder engine with a modest 1.2-litre displacement. Last night, Chevrolet offered the first official glimpse of the eighth generation Corvette. 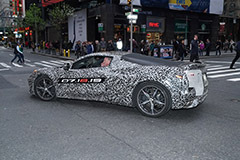 It was briefly driven around New York with a camouflage livery that also featured the clear date of July 18th when the 'C8' will be revealed properly. What is very obvious is that the all-new Corvette will be mid-engined. Another manufacturer offering a teaser this week is Bentley, who showed an outline and the mascot of the upcoming Flying Spur. Audi, meanwhile, have introduced the TDI version of the S6 Avant, S6 Sedan and S7 Sportback. The trio is powered by the latest generation, 3-litre V6 engine that features an auxiliary electric turbocharger that provides boost low in the rev band to eliminate the lag that turbocharged engines usually suffer from. The TDI V6 produces 344 bhp and a staggering 700 Nm of torque. All three models feature Audi's 8-speed Tiptronic gearbox and the familiar quattro all-wheel drive. Our racing season kicked off this weekend with the Espiritu de Montjuic, held at the Circuit de Barcelona-Catalunya. A celebration of the rich heritage of the street circuit on the nearby Montjuic hill, this event also served as the season opener for organiser Peter Auto. 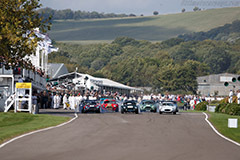 The first of six events on the calendar, it featured all the familiar grids, which now also includes the Endurance Racing Legends for 1990s and 2000s machinery as a set fixture. 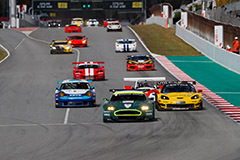 This meant that sports cars, GTs and touring cars from the last seven decades were represented during the action packed weekend. 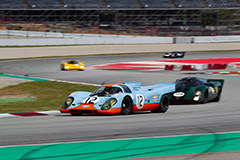 Among the many highlights were victories for evocative machinery like a Gulf-liveried Porsche 917 K and a Bentley Speed 8. Another star car was a very rare Sauber C8 Mercedes, which was driven in anger for the first time in many years. Although spring was clearly in the air, there was also some rain during the weekend and on Sunday some of the nearby mountains received a fresh sprinkling of snow. This did not dampen the spirits at all as can be seen in our 220-shot gallery that serves to illustrate a concise report about the 2019 Espiritu de Montjuic. At this weekend's 117-lot Bonhams Goodwood Members' Meeting sale an eclectic mix of historic road and racing cars will cross the block. Among the most unusual is the third Lola LC89 Lamborghini built. 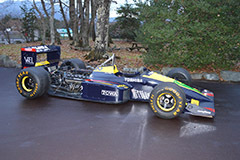 Fielded by the Larrousse team, this was used in Lamborghini's first Formula 1 season. The example consigned was raced extensively in 1989 and was then pressed back into service for the opening rounds of the 1990 season. It then spent the next 28 years in a museum but can now be yours for in excess of GBP 135,000. Another prominent machine in the lot list is the very Ferrari 365 GT4 BB that was delivered new to Elton John. Cherished throughout its life, it has survived in a lovely original condition but has benefitted from a recent mechanical overhaul. The 'Berlinetta Boxer' should sell for between GBP 250,000 and 300,000. One of our favourite cars in the sale is this immaculately restored Fiat Abarth 750 Zagato Coupe. After a poor result at Pebble Beach in the early 1990s, the then owner spent many years gathering correct components for a ground-up restoration that ultimately was not completed until the car had changed hands in around 2010. Now consigned with a great selection from the Key Collection, chassis 497034 has a pre-sale estimate of GBP 90,000 - 120,000.